Mere hours after Oppo unveiled the R15 duo, vivo followed suit and announced its top-tier vivo X21 smartphone. It packs a 6.28" AMOLED screen with a notch, runs on Snapdragon 660, and has a dual-camera on its back. Sounds familiar, right? So, the X21 has a 6.28" Super AMOLED of 1,080 x 2,280 pixels at the front. In its notch sits a 12MP selfie shooter behind f/2.0 lens accompanied by an IR fill light, so it can do fast Face Wake 2.0 with 3D mapping. There is a dual-camera setup on the back with 12MP f/1.8 main shooter and a 5MP f/2.4 secondary one for various background effects. The vivo X21 runs on Snapdragon 660 chipset with an octa-core Kryo processor and a dedicated AI core, Adreno 512 GPU, and 6 GB of RAM. The available storage options are 64GB and 128GB. There is also a special 128GB model with an under-display fingerprint scanner. We saw the Apex concept phone by vivo at the MWC, and even before that already managed to employ the tech inside the vivo X20 UD. The regular version will have the fingerprint sensor put at the back. The X21 has a 3,200 mAh battery with fast-charging support. It runs on Android 8.1 Oreo with Funtouch OS 4.0 launcher. The 64GB model costs CNY 2,898 ($458), while the 128GB is priced at CNY 3,198 ($505). Those two will be available in Aurora White, Ruby Red, and Black. Orders begin on March 24 at midnight. The X21 UD comes only with 128GB storage and will set you back CNY 3,598 ($568). It will ship in Ruby Red or Black on March 28. Now that Oppo and vivo announced their headliners all eyes go on OnePlus, which should be debuting the 6 with the same design but more capable Snapdragon 845 chipset shortly. 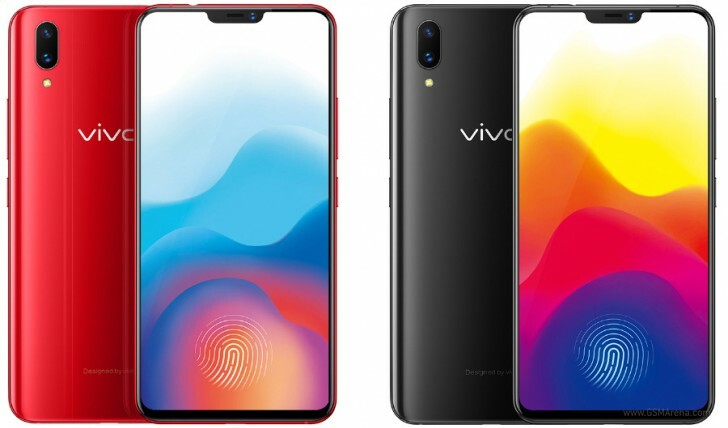 vivo is also expected to announce the mid-range V9 on March 22.